Sunshine Coast Orthotics Experts: Orthotics can help you run faster and more efficiently, reduce and prevent injury rates plus rehabilitate injury faster! At Footsure Podiatry we are one of the leading experts for Sunshine Coast Orthotics. We have the latest 3D laser foot scanner to provide the most accurate and efficient model of the foot from which our custom computer designed foot orthoses are manufactured. Custom foot orthoses are used by Podiatrists at Footsure Podiatry to facilitate the most efficient function of the foot during gait to prevent or rehabilitate foot and lower limb injuries. The aim is to treat the cause of the problem and allow the body to repair itself. Orthotics may be used in cases of Achilles Tendinopathy, Plantar Fasciitis, Bunions and many other instances where function of the foot needs to be improved to allow rehabilitation of structure or to prevent further injury. 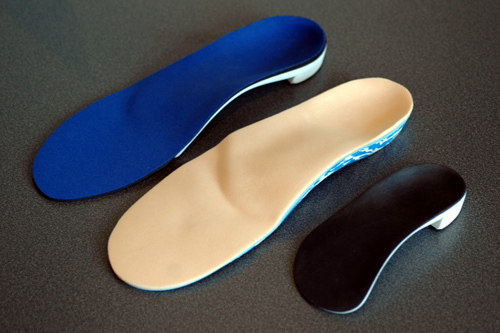 Orthotics are available in both polypropylene (firm) and EVA (soft). Footwear is also an important part of the process and advice on correct and appropriate shoes will be provided. The alternative to foot orthoses Foot Mobilisation therapy in many cases may be used in conjunction with orthotics to increase the speed of recovery and prevent further injury or may be used on its own. At Footsure Podiatry, we have a policy of only suggesting custom orthotics if we genuinely believe that it is the best course of action for your unique situation. We often get comments from patients after they get orthotics that they can’t believe they lived without them previously and they love being able to get back to doing normal day-to-day activities without pain or discomfort happening any more. Footsure Podiatry are one of the leading authorities on Sunshine coast custom orthotics on the Sunshine Coast / Maroochydore area. What’s the difference between custom and off the shelf? There is a huge variance in foot orthotics that are available, their design, manufacture and materials constructed from. The key difference to most orthotic choices is are they off the shelf or are they custom? True custom made orthotics are manufactured specifically for the individual from an impression of the foot via a laser scan, plaster cast or foam box impression. The health professional then designs the orthotic from an assessment of the person’s foot function and gait. The goal of a true custom made orthotic should be facilitating efficient foot function. Not supporting the foot but actually changing the function to work better. Off the shelf can sometimes be called custom incorrectly if they are customised or if a salesperson chooses the type of off the shelf for the person they may call this custom. Off the shelf orthotics vary significantly in quality from true pre-fabricated generic orthotics made in common designs to suit some foot types to a simple foam insole or gel insert. The one key thing in all of these is they come in a packet and are available immediately. Some brands can be customised to fit better however they are never specific for the foot. What can happen if I get incorrectly prescribed orthotics? As health professionals off the shelf can be a treatment option in cases where only minor intervention is needed and are very helpful however some companies market pre fabricated orthotics as custom and they are fitted by a salesperson with minimal knowledge of foot and leg biomechanics and function. What’s the (high level) process of getting custom orthotics made? At Footsure we have extensive experience in assessing, designing, manufacture and prescription of custom foot orthotics. Our specific process of orthotic prescription always involves an assessment of gait and foot biomechanics, range of motion and strength testing and specific podiatry assessments relating to your foot, knee, hip, back issues. Once confirmed as the best treatment option we take a 3d laser scan impression of the feet and begin the biomechanical design process through further assessments. Our design process is completed online with hundreds of different parameters available to choose specific designs. The orthotic laboratory then manufactures the orthotics with a computerised milling machine to our specifications and materials which generally takes 5-7 days for completion and to be ready for fitting. Fitting the orthotics involves checking the function and shoe fit of the orthotics but also how they feel. We live by the rule of if orthotics hurt your feet then they are wrong, perhaps it shoe fit or is slightly too long but also could be the design is the incorrect choice. As with off the shelf orthotics this can be a problem and we always provide advice on what to be careful of.] and how to wear them in carefully. If you had any questions, feel free to contact us. To learn more about whether you need custom orthotics and what your options are, book an appointment online by clicking here. Late appointments may be available on request. Footsure Podiatry is one of the Sunshine Coast’s leading podiatry clinics. We’re passionate about helping our clients with foot and leg problems so they can spend more time doing what they love most.